From our industrial roots near to Scunthorpe, we undoubtedly have the required experience for creating productive and effective industrial units in our region and further afield, as we have proven with a portfolio of impressive schemes. Should your project be a small extension or a refurbishment to your current premises, to expand or upgrade, or a complete design and build of a new development, such as a major warehouse unit or new distribution centre, Harrison Eastoft has the experience to cater for every aspect of all project sizes. There is a constant rising demand for industrial buildings in today’s commercial environment, meaning it’s more important than ever to find the right solution for your business. 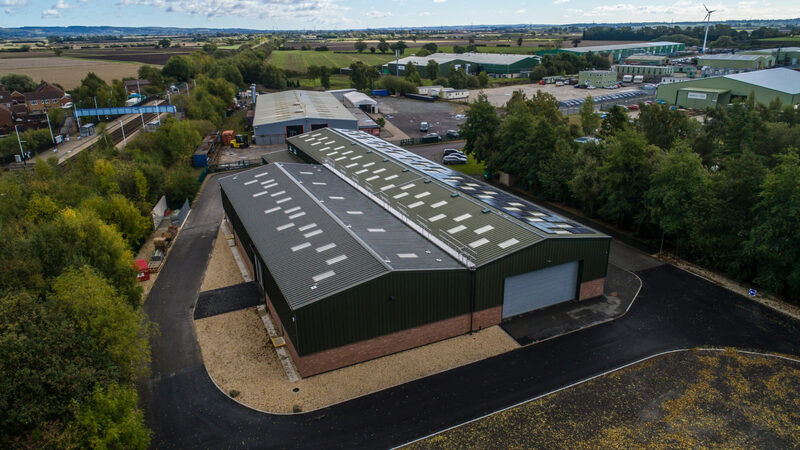 Harrison has particular expertise and experience in the design and build of industrial units, including the sourcing and securing of a prime location. We can relieve the complexities of planning consent, break down the specification and budgeting, and manage the demand of an industrial development’s construction process, from conception to completion. expectations. We will ensure your next industrial unit is practical and productive for your whole business. which works for you, engage with you to achieve your ideal specifications and technical requirements, plan for your future growth and ensure the perfect outcome to progress your business. You will be in control of your destination with us, enabling you to capitalise on your commercial potential. We understand and appreciate environmental considerations, in the commercial industry especially, considering both legislation requirements and your priorities during such a construction project. We aim to satisfy your green goals whilst adhering to the mandatory industrial policies. Harrison Eastoft can deliver your requirements to achieve an efficient working environment. We have completed highly technical civil engineering schemes for a huge variety of industrial developments, often meeting challenging demands. We understand the entire project, and are able to facilitate in all areas, such as transport, parking, drainage and tank bases, with our advanced skills and experience. Harrison really does have the capacity to cater for all your operational needs. Harrison Eastoft also boasts its own builders’ yard, and steel fabrication and joinery workshops, for exclusive use on our projects, to create bespoke solutions. This is especially advantageous in the construction process for industrial units. We keep control to ensure that the highest quality and service is maintained at every stage and within the required timescale and budget. For guarantee, all of our steel framed buildings are fabricated to BS EN 1090-1 and carry the CE Mark. Apart from the vital practical priorities of industrial units, branding and image is an important part of the Harrison Eastoft design and construction process. We value the importance of this for our commercial clients and feel that the body needs a personal appearance to promote a business, as we’re sure you would agree. We can provide the entire solution in one encompassing project, to ensure you are fulfilled by your commercial presence. Harrison Eastoft has an extensive list of satisfied commercial clients, all gratified by our high levels of service, reliability, quality, and attention to detail, which we have proven over and again. Harrison Eastoft is an experienced building contractor and has delivered as promised each and every time. Our tradesmen are highly skilled and trained professionals, and have vast experience in the commercial sector. Our safety record is as excellent as our service. I’m sure you would be impressed by our competence levels, as previous and current clients are. We are very proud of our achievements. Let us “steel” the show with one of our industrial developments. Please contact our friendly and approachable team for a simple consultation and we’ll seek to provide a fast and cost effective solution for your specific requirements.